This post originally appeared on The Ink Nouveau, but since I use this blog as an archive I thought it best to put it up here as well. When Brian put out a request for guest reviewer I immediately volunteered. 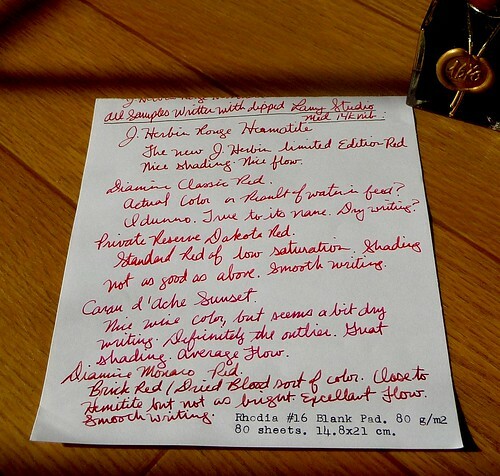 Since the J. Herbin 1670 ink had just launched I thought it would be worthwhile to do a comparison of red inks from a few of the manufacturers he carries. 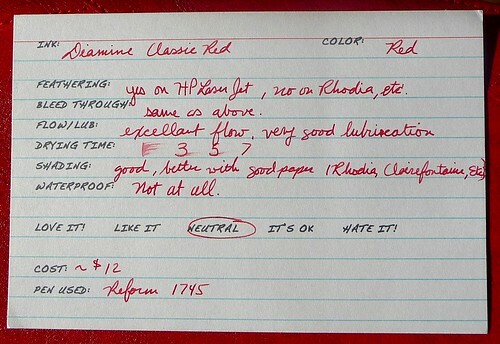 Brian sent me a sample of every ink reviewed here except the Diamine Monaco Red. I already owned that one. Apart from being a customer of his I am not otherwise affiliated with Brian. I am also not affiliated with any of the manufacturers reviewed herein. I must admit that this was by far my least favorite of the bunch. It is the only one that misbehaved on my everyday paper: HP LaserJet 24lbs. However, it does perform well on Rhodia, Clairefontaine, etc. 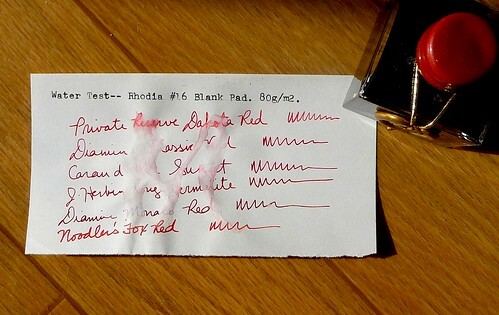 If you plan to use this ink plan to use it with premium papers. The shading is quite good and the flow is excellent. I’m not much on the color, but the name is fitting. It is a dullish medium red. 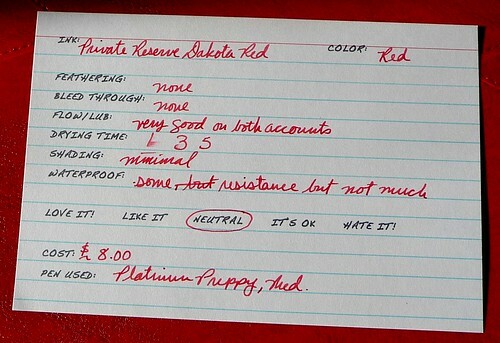 This is an attractive pinkish red. It is the outlier in this group. None of the others exhibit this pink quality. This ink is the driest feeling of the bunch. But, has some of the best shading, and it is one of the fastest drying. 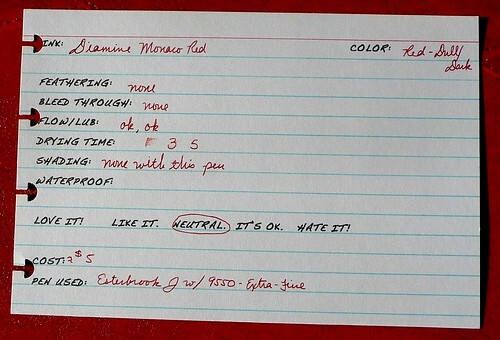 This is a brightish medium red. When I researched this ink I found some complaints of the ink clogging pens and/or throwing precipitants. When I informed Brian of this he told me the ink has been reformulated, so I decided to test it out for a while. I put it in a Platinum Preppy and left it to sit for one and a half weeks. I am happy to report that there was NO CLOGGING and NO PRECIPITANTS. Believe it or not, this ink is actually the best behaved out of the bunch. There is some shading, and it is fast drying. It flows well, and it is pretty good so far as lubrication is concerned. In addition, it is one of the least saturated, but also the most water-resistant. All in all not a bad ink. This ink is from my own personal stash. 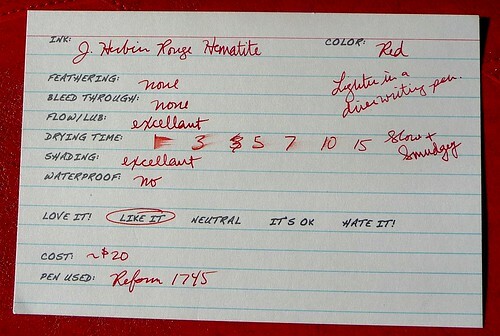 I tend to use it for grading because its brick red blood color is dark enough to be easy on the eyes, but still red enough to catch the students’ attention. It is very well-behaved even on cheap student paper. I prefer it in an extra-fine or fine nib, but in a wider nib you get lots more shading. Now for the ink of the moment! This ink is FANTASTIC! I have to say that I’m not the biggest red ink fan in the world, but as soon as I got this ink down on paper I was enamored. Furthermore, of the inks Brian sent to me this is the only one I went out and purchased (Brian is expecting a shipment soon. Until then, make sure to contact him to be placed on the waitlist). The color is similar to that of fresh blood. I’d describe it as a red-orange mixed with maroon. It’s very appealing. It’s also quite vibrant, but not unpleasantly so. It has the best flow and lubrication of the inks compared here. 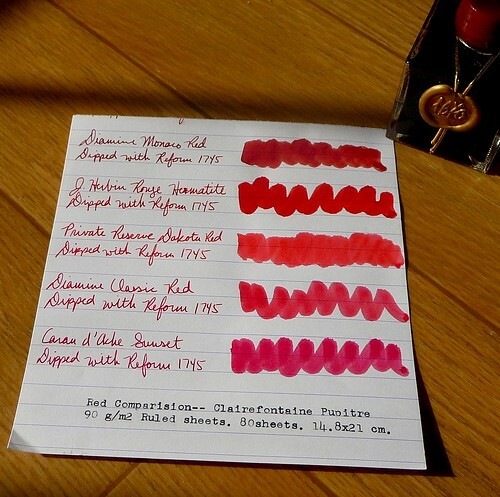 It is also the most saturated, which is surprising for J. Herbin. 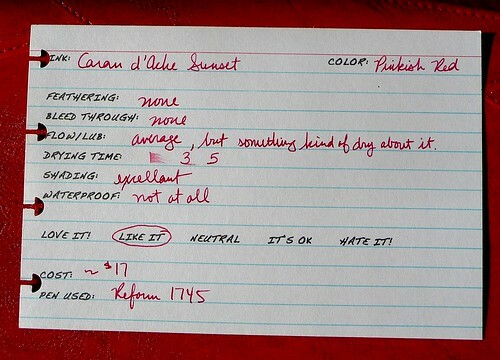 Unfortunately, because of that saturation this ink is slow drying and it remains smudge-able long after it is dry. Do note that this is a limited edition ink, so if you want some you may want to act fast! Below are a couple comparison shots and a picture of the water test. I apologize in advance for the colors. I simply could not get these comparisons to display all the reds accurately. Please refer to the card shots above for more accurate representations of these inks.